The famous Library of Alexandria anticipated it. Carl Sagan dreamed of it. Many hands and eyes are ready to build and maintain it. The time has come for the birth of the Temple of Secular Science. We propose the Order of Science. The civilized Homo sapiens wants and needs to participate in deeply moving, enlightening rituals about the history of the cosmos, life, humankind and civilization. The Order of Science is a secular order with a mission to promote science, meditation and monastic discipline. The Order will advocate meditation and science first and foremost. It will also cultivate community and tradition such as that found in a monastery, temple or parish church. We are devoted to environmental awareness and enlightened political activism. We need meditation and mnemonics down to a science, taught in schools, and regularly demonstrated with celebratory flair in all major public venues. We require an organized system of wise observations on vital issues facing our earthly existence, based in science, and performed like rock concerts and religious services in enormous stadiums and grand cathedrals. It begins with a well-framed proposal. We start with nothing and the totality of the cosmos and use the deductive method of science to discover the bare essentials of a happy, enlightened and productive human life. We explore all aspects of human life, including fields like environmental conservation, healthcare, education, economics and politics. We examine the necessities of life and the deprivation of each: fresh air, clean water, healthy diet, moderate sunlight, security, sleep, rest, exercise, dress and shelter. 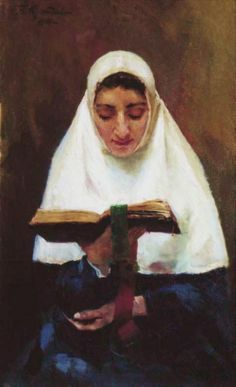 The three major meditation systems of the Order of Science are the Daily Meditations, Lectio Scientia, or Scientific Reading, and Insight Meditation. 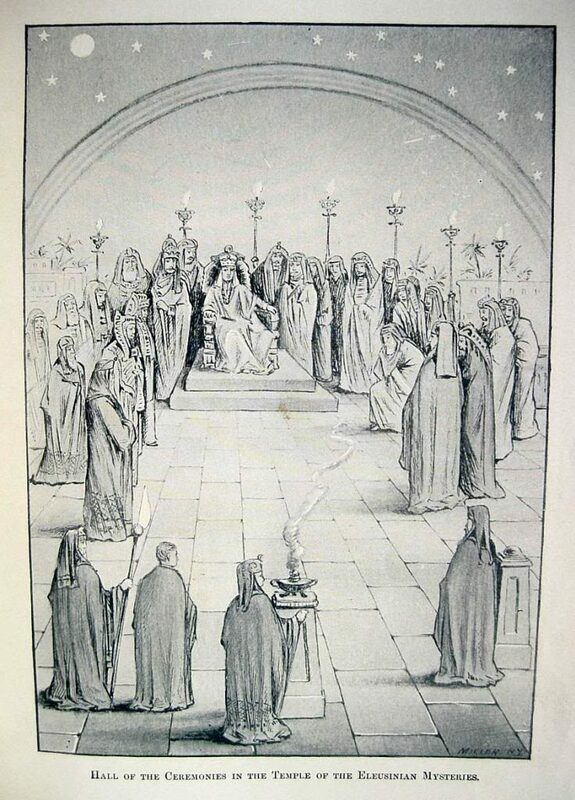 The Order of Science follows current scientific research cataloging the quality of life measures within religious populations, and scientific research on ritual, meditation, monasticism, and the improvement of the same at individual and community levels. The Order of Science recognizes twelve general aspects of meditation. Discussion and a more scientific categorization of these subjects is welcome. Beginning with an introduction with statistics based on measures of necessities and quality of life by Pew Research Center, Gallup, World Bank, World Health Organization, and other sources, we study the effects of the philosophies, rituals and life-styles of the adherents of the main world-views on earth. We are specifically interested in topics like the environment, prosperity, health (and disorders), self-actualization, education, ethics and human rights. Environment creates genius. It nurtures love, conceptual mind, vocabulary, and survival skills. Humans learn by example. The alchemist considers several factors when choosing his healing and learning environment. It should be fun, pleasant, healthy, interesting, and intellectually stimulating. It should be inspiring, with religious, Classical, Baroque, Sitar or other appropriate background music; it should be surrounded by life. There should be adequate light, food, hydration, and fresh air. Environment may also destroy genius; this is why we safeguard the methods of preserving genius under hostile conditions. The Order of Science laboratory or temple is not a religious or academic temple, but a place for direct observation. It is, in this sense, a laboratory. The Chinese Daoist temple is called a “guan,” which literally means, “to observe,” as in direct observation as opposed to theology or academics. The Order of Science laboratory is a guan, a place to observe, the sanctuary of the observer. Modern scientists have always used experimentation with repeated observation. As experiments are done to test our hypotheses, the evidence builds, and new theories are developed. 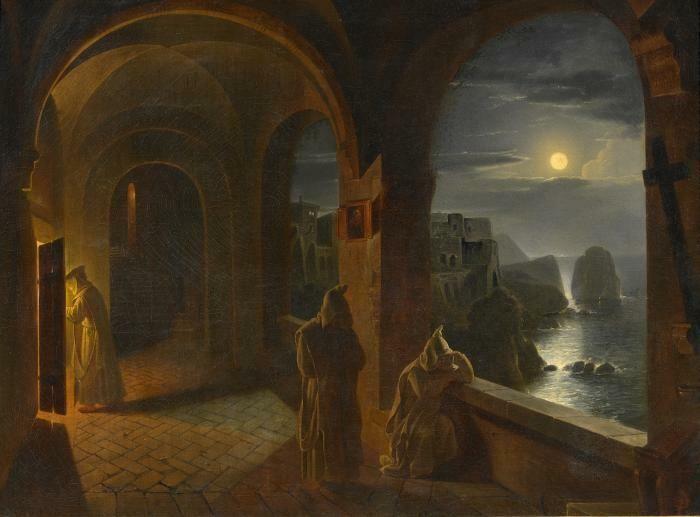 Historically, the alchemist’s laboratory is the original, fertile birthplace of modern science, which, while searching for absolute truth, forever evolves with time. The Order of Science Laboratory is a secular sanctuary. The Order of Science shares basic scientific humanist philosophical tenets with many respected scientists and academics, such as the naturalist Sir David Attenborough and the late Cornell University professor Carl Sagan. It aligns with the non-superstitious aspects of several forms of Buddhism; the Daojia and the early spirituality of the United Nations, which was still generally monotheistic. 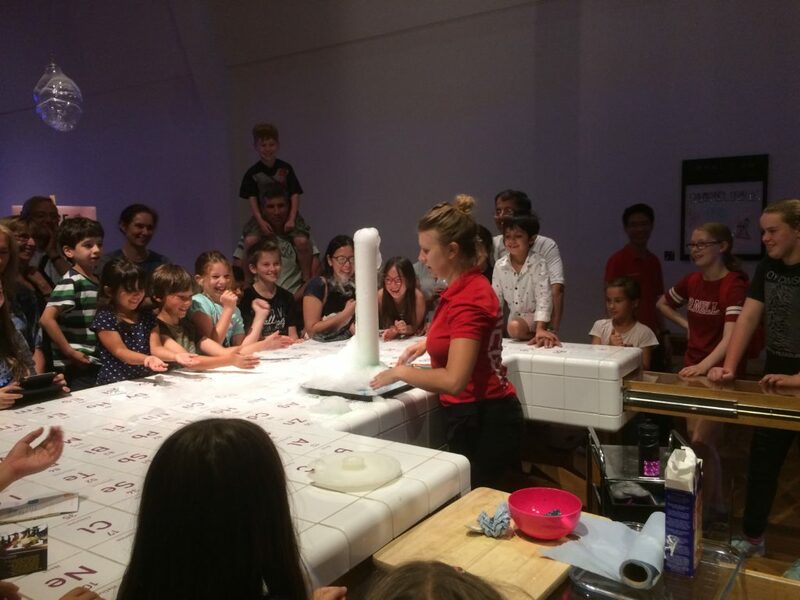 All temples, including synagogues, churches and mosques, can support Order of Science laboratories. Any house of faith can carry on with business as usual alongside this secular doctrine, with liturgy, music, social hierarchy, social work, and all else. The healthy scientist periodically returns to nature without reservation; as unencumbered by attire and possessions as possible, surrendering to the natural environment, as far from reminders of civilization as he or she can manage. It is in this retreat, this return to the bosom of Mother Earth, that one finds natural peace and harmony. The secrets of nature are revealed to one who silences oneself, opens oneself, and listens. Clinging to no thought, no perspective, the observer embraces the One, the Source. The truth that is greater than human faculties may grasp teases the mind and the human threshold expands. Therein lies genius. There are four traditional ways to sit that are comfortable for most people. Sitting on a cushion really helps. During meditation, if you get too uncomfortable, you can change from one position to another. As you practice you will be able to sit still much longer. Yogic, Buddhist and Daoist postures are usually safe, healthy and enlightening, but one must use moderation and be careful to avoid over-strenuous positions. An advanced yogic posture is the full lotus, where both heels rest on the opposite leg. The half lotus position is like the full lotus, but the right leg rests completely on top of the left. A simple position, known in Japan as “seiza,” is to fold your legs at the knees and sit on your heels, but put a cushion over your heels. Hands in this posture are usually placed palm down with fingers together on the thighs, or they are placed in the lap. Maybe the most natural posture today is to sit up straight in a chair, resting ones hands on the knees or in the lap. Standing, walking and running, like qigong, taijiquan and wushu, are basic, healthy forms of active meditation. Yogic, Buddhist and Daoist postures are usually safe, healthy and enlightening, but one must use moderation and be careful to avoid over-strenuous positions. Religions of Indian origin have developed many hand gestures over the course of time to use during meditation. A hand gesture is called a mudra. In yogic meditation one may keep the hands open with the palms facing up, resting on the knees, or touch the tip of the index finger with the tip of the thumb of each hand. Hands may also be placed together in prayer next to the solar plexus. Daoists touch the tips of their thumbs together, the right thumb inside of the left hand, the left hand a fist inside the closed right hand. Zen Buddhists touch the tips of the thumbs together and cradle the left fingers in the right fingers, forming a circle with the digits. The Zen master Dogen’s Universally Recommended Instructions for Zazen (Fukan zazengi) instructs the meditator to find a place to sit, put down a thick mat and place a cushion over it. Sit in the half-lotus or full-lotus position with your left foot on top of your right thigh. Wear loose clothing, preferably robes, and arrange your attire neatly. Rest your right hand on your foot or leg and place your left hand in your right hand, touching the tips of the thumbs. Sit up straight, ears aligned with shoulders, nose aligned with navel, and avoid leaning in any direction. Keep your lips shut and teeth together, resting the tip of your tongue on the front of the roof of your mouth. Keep your eyes open looking past the tip of your nose and breathe softly through your nostrils. This is key – you must keep a very straight spine. Imagine you are balancing a teacup on the crown of your head. Imagine a line running vertically through the center of the earth, your spine, the crown of your head and up into the sky. This may not feel good at first, but eventually you will grow into it, believe it. In standing meditation the vertical line may be visualized as life-force and raised upward through the heels and the crown from earth to sky. Gently reminding yourself to keep an erect spine throughout the day will also help your posture and meditation. As a regular exercise, practice breathing from your center of gravity, about two to three inches below the navel, known as the sacral chakra (Svadhisthana), lower dantian, the hara and the one-point. Deep breathing will assist your posture, making you conscious of the tilt of your pelvis and lumbar region. Keep your pelvic muscles contracted and your abdomen firm when you stand and walk. In public, this meditation may be done sitting, standing, walking, and generally going about one’s business, quite naturally. These guidelines should be considered with the advice of a licensed health care provider such as a physical therapist or physician. Breathing is the perfect and natural foundation for meditation, as it represents spirit, life, and the polarity of opposites. Every manifestation has a foundation, a center and an apex; a rising, expanding, falling, and resting stage. Thus the universe is merely a repetitive expression of this pattern or cycle. Like inorganic forces, all organic processes occur in cycles that may be marked by opposite actions. From sleep and waking periods to muscle relaxation and contraction, from sense and motor functions to nutrient consumption, the organic body is organized bisymmetrically. 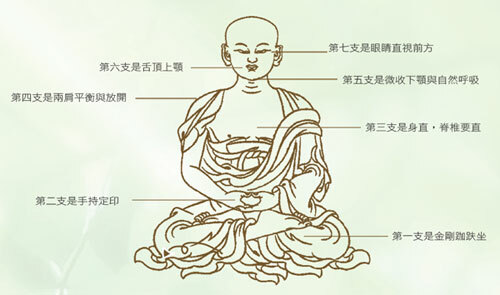 The physical body must alternate between periods of strenuous exercise and deep relaxation and therapeutic massage, and the mind must also exercise its functions with varied experiences, ongoing research including study of the liberal arts, and active conversation and debate with other human beings. The mind must also receive its own “therapeutic massage” with the experience of stability, visualization, and meditation. Prana in Sanskrit implies variously the breath, the breath of life, energy, spirit and life-force. Pranayama is the regulation of the breath or life-force by breathing exercises, which is one of the eight limbs of Ashtanga Yoga advanced by Patanjali in the Yoga Sutras. Pranayama, a method of relaxation, is preliminary to concentration practiced to induce Samadhi, the meditative trance of mystical oneness. The supreme posture is Siddhasana, sitting in half lotus position, with one foot over the opposite thigh, chin on chest, looking steadily at the third eye. Padmasana, also known as Full Lotus, with both feet resting on the opposite thigh, is also traditional. Several forms of pranayama are basic exercises of Hatha Yoga, for example, the popular Nadi Shodhana (“channel purification”) Pranayama, or alternate nostril breathing. This practice is done by sitting in asana with a straight spine, left hand resting on the left knee, either open or in the Dhyana (Jhana or Chan) mudra hand position. A mudra is a symbolic ritual gesture, usually with the hands, in Hinduism and Buddhism, as well as Indian classical dance. The Dhyana mudra joins the tip of the thumb and forefinger, extending the other fingers in a soft arc, with palm facing upward. Place the tips of the index and middle fingers of the right hand between the eyes, rest the thumb on the right nostril of the nose, and rest the ring and little finger on the left nostril. Close the right nostril with the thumb and exhale out of the left nostril. Take a gentle pause, then inhale deeply through the left nostril. Release the right nostril and close the left nostril with the ring finger, exhaling through the right nostril. Inhale through the right nostril and then close it with the thumb, releasing the left nostril to exhale through it. This is one complete cycle of the alternate nostril breath. To prepare for Daoist meditation one may take a walk in a park, on a seashore, or elsewhere in nature before going indoors to meditate, if one goes indoors. One may hang a Taijitu, the yin-yang symbol, on the wall at eye level or visualize one in the Lower Elixir Field, the center of gravity just below the navel. One may use incense to mark the time. Find a comfortable posture. Fix the eyes on the tip of the nose or close them. Close the mouth and touch the palate with the tongue. One may use any object to stare at instead of the nose. Then one concentrates on the original cavity of spirit, the Mysterious Pass or Third Eye, without strain or relaxation, in order to realize the Oneness of all things. Breathing is even, that is, inhalation and exhalation of successive breaths are of equal length. Two monks, Myoan Eisai and Eihei Dogen, brought Chan/Zen Buddhism from China to Japan. Dogen wrote the Kukanzazenji, the treatise that introduced the practice of meditation called zazen. Zazen is sitting meditation. It may begin with a counting of the breath, simple awareness of the breath, or only simple awareness – “just sitting.” Zazen may be practiced for any period of time. Relaxation methods begin by relaxing the physical body. This relaxed state expands throughout the body, releasing muscle tension, stress on the organs, and even the activity of the brain. When one practices relaxation techniques, it is important to not slip into a state of unconsciousness. The way to maintain conscious awareness during deep relaxation is to concentrate. Concentration techniques are taught simultaneously with relaxation, because the correct harmony of these two seemingly opposite states is one way to reach a state of pure awareness. The Body Scan exercise is a proven method of relaxation. Lie down comfortably, knees and neck supported with the proper pillows, arms at your sides or crossed upon the chest, and legs uncrossed. Imagine warmth in the very tip of your left big toe, and let your toe relax as the warmth fills it. Where the warmth goes, you will relax, and it must move smoothly and consistently. Very slowly let it rise up through the whole toe. Let it fill each toe in turn, and fill the whole foot, let it slowly rise up your leg, and when it reaches your pelvic area, begin with the toe of the other leg, until both legs are filled with the warmth. Let the warmth proceed up the spine and spread out to fill your torso, each arm at a time, to the finger-tips, the neck and head, until your whole body is filled and relaxed. At this time, just let the warmth continue to relax your body until you are energized. Concentrate on your breath, which should be natural, but even and deep. When you sit up, you may clap your hands four times to wake up, or ring a bell. You can do the exercise sitting up, or even standing, if you have to, but do it lying down, first. Practice each night before you sleep. Calming the mind by concentrating on the breath is a good way to begin meditation. 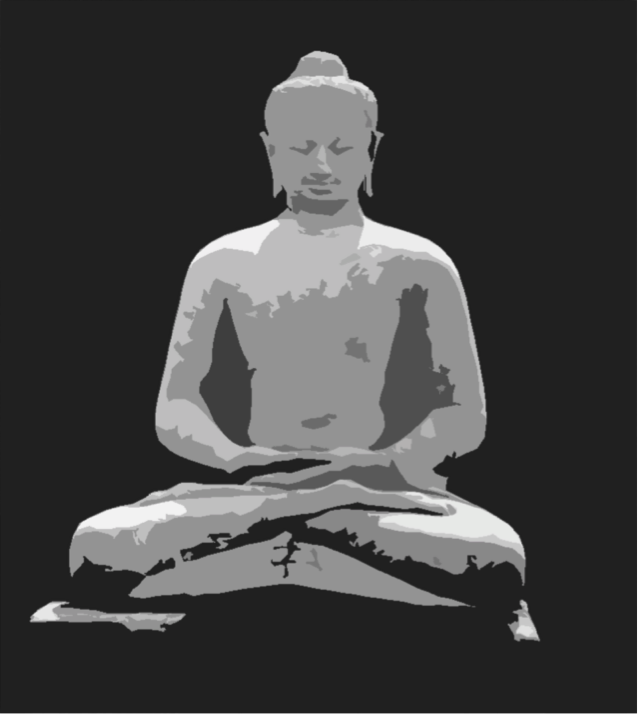 Early Buddhism originally focused on Dhyana, contemplation and meditation leading to Samadhi, enlightenment. 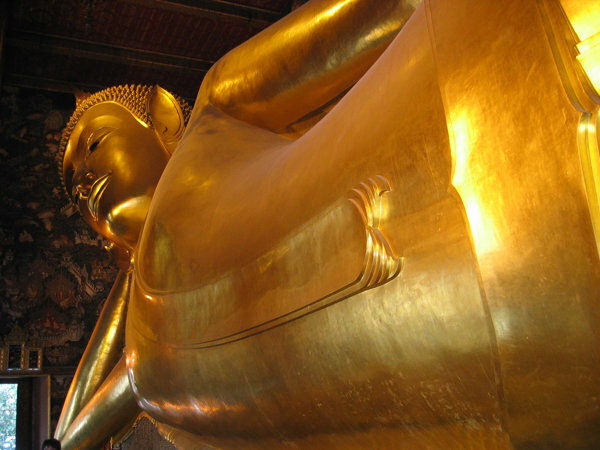 Within the first millennium of Buddhism, monks analyzed meditation further and categorized it into a combination of two parts: calm and insight into reality. The two types of meditation that consequently developed in Buddhism are called Samatha and Vipassanā. Samatha, which means ‘calm,’ is the calming of the mind by concentrating on the breath or an object of meditation. Vipassana means insight into the nature of reality, i.e., the three characteristics: unsatisfactory, impermanent, and devoid of selfness. The highest goal of Buddha’s meditation is Samadhi, the complete union of the mind, known as enlightenment or illumination. For thousands of years, meditation has been known as a three-fold process: Dhāraṇā, or concentration; Dhyana, meditation; and Samadhi, enlightenment. The primary Sanskrit term for meditation is Dhyāna, the root of which is Dhi, the vision of the imagination, associated with Saraswati, the goddess of knowledge, wisdom and poetry. Dharana is concentration with controlled breathing. Its object can be an idea, a god, an object or even a point, such as the tip of one’s nose or one’s center of gravity. In your chosen posture gently and consistently train your mind to one-pointedness. The mind should be empty of contents. Practice a moderate length of time each day, not forcing it to the point of rigidity, but certainly working past many discomforts and disappointments. Sitting in your posture with right hand in left, the tips of the thumbs touching, keeping the spine erect and eyes forward, breathe naturally and allow yourself to relax. One may use visualizations like those of inner alchemy. Imagine a sphere of light encircling your body. This sphere not only acts to purify your entire being, it also is a shield to protect you from all negative energy. Feel earth below you, heaven above, and your human being in the center. The proto-scientific symbols of the three elements directly observed through this simple method of concentration are the alchemical Moon, Sun and Mercury, respectively. The Mind Palace and Cosmic Human described below are also suitable visualizations to prepare for more focused meditation. Another method is to focus on your center of gravity, about fifty mm (two inches) below the navel for men, seventy-five mm (three inches) for women. This location is your ‘one-point,’ and may be thought of as the gate to no-mind. It is the center of balance of a man, where a woman’s is a bit lower due to her hips. Imagine light or energy extending in all directions from that point. This is the point to return to whenever you need to ground yourself. Other points of focus may include such targets as a candle flame, the tip of the nose, or any of the chakras of tantric yoga as they are imagined along the spine of the body and in the skull, such as the Third Eye. Western symbolic alchemy has developed visualizations similar to those of the tantric systems. Bringing attention back to focus on the breath may be a useful way to meditate. Mantra, or repetitive chant, may also be used as a method of concentration. Proper ritual ceremony is, as a rule, a catalyst for attention. Ideally, concentration culminates in the mindful awareness known as enlightenment or illumination. While a painful or malevolent experience is occurring, when one gets angry or afraid, one can regain one’s calm by simple breathing and stillness. Basic side to side or up and down movements of the waist and arms helps calm some people. The science monk or nun can imagine the purified Microcosm in the Mind Palace behind the Third Eye, visualizing oneself as the Cosmic Human in silent meditation. Chronic emotional pain requires deep healing. Deep healing may begin with a preliminary meditation for relaxation for fifteen to twenty minutes. At the first rising of any emotion one can first quietly observe the breath. Calm down by taking a few deep breaths. When the breath has been calmed and silenced, observe thoughts, emotions and feelings. Let these distractions flow by as they do naturally. Doing the relaxation exercise, mentally scan for pain and release it, observing your anatomy. Feel healing, visualize healing, and be positive! This positive energy is life-force. Probe your memory of the past for painful or malevolent experiences. Release them all. Forgive completely. This is a way to homeostasis and inner peace. Heal emotionally. Connect with the source of life, one’s ‘Original Self’ or ‘True Nature.’ Connect with nature. Connect with people. Let negative feelings flow. Go with the flow. Do not fear or deny them, but express them with the positive intent to heal. Replace negative feelings and thoughts with a positive attitude by clearing out the negative. Then use your willpower to gather to your center the positive forces of the cosmos, like the energy of the natural elements from the earth, water, the sun and the air, and the vastness of space. Use this positive energy as a healing prayer for yourself, your family and loved ones, your local community, your province, your nation, the Order of Science, the whole earth and Cosmos. This is a love and compassion meditation. Always bring your awareness back to your body at the end of the exercise with a few deep breaths, blinks of the eyes, and gentle body and limb movements and stretches. This is a good preparation for or conclusion to Insight Meditation. The Daoist school advances the theory of the Dao or Way, describing it as the origin of all things, and asserting that humans can become immortal by returning to it. The Way is empty, deep and still as an abyss. It is eternal and may be used infinitely to moderate extremes, bring tranquility and nurture qi or life-force (for our purposes life-force means health). 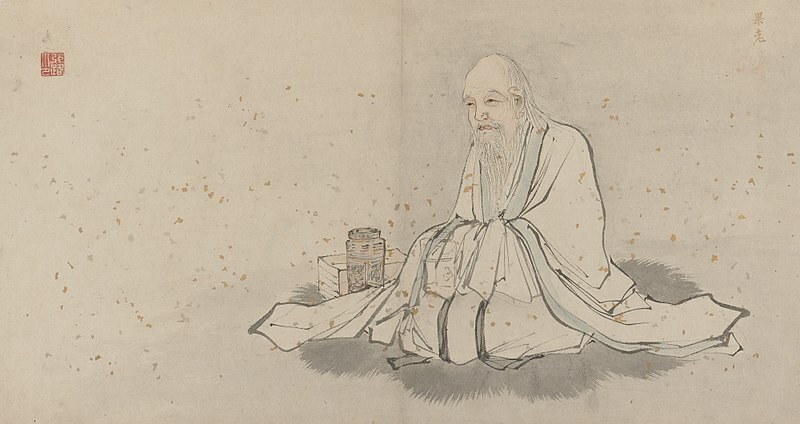 Laozi’s Daoism is a natural humanistic philosophy possessing many elements shared by the philosophies of secular humanists, who promote science as the theory and practice of discovering the underlying laws of nature. The oldest book of Chinese wisdom, the Yijing, or Classic of Change, is founded upon the yin- yang theory. The Yijing relates a philosophy of predictable absolute reality based on the universal cyclic behavior of yin and yang energies. Yin and yang can symbolize, as the two fundamental polar elements of reality, the positive and negative charges at the foundation of the existence of all energy and matter. The yin and yang together in the familiar symbol are called taijitu. The cosmic opposites may signify the ones and zeros of the binary numeral system. They may also represent the positive and negative values of algebra, where Wuji, naught, is the “origin” or zero at the center of the algebraic graph of space and time. The algebraic graph is a tool used to mathematically explain rules of existence and change within the dimensions of space and time. To the Daoist alchemist yin and yang also indicate the mortal microcosm and eternal macrocosm. “Geometry existed before the Creation. It is co-eternal with the mind of God… Geometry provided God with a model for the Creation… Geometry is God Himself.” Thus said Johannes Kepler, Harmonice Mundi, The Harmony of the World (1619), book IV, Ch. 1, in a translation from Carl Sagan’s Cosmos. This quote from one of the world’s greatest scientists reflects a Masonic understanding of the symbol ‘G,’ found in every lodge above the Worshipful Master’s chair, and sometimes between the square and compasses, the official logo of Freemasonry. As for the Way, the Way that can be spoken of is not the constant, eternal Way. As for names, the name that can be named is not a constant, eternal name. The nameless is at the beginning of all things in the universe and on the earth. Once named, it is the origin or “Mother” of these myriad things. Constantly without desires, one realizes the mystery and perceives its subtlety. which one desires and seeks. The Eternal and its manifestations together emerge from one Source. These are two and yet they are One. Scientists have found that ritual has many benefits, from the subtle to the most concrete, such as illuminating perspective and meaning in life; strengthening the bonds of family and community; transmitting knowledge and values; cultivating emotional development and stability; conditioning positive states of mind, habits and responses; helping to cope with change, anxiety, fear or grief; and building confidence. Humans, like other plants and animals, live according to natural cycles. Humans depend on cycles to sleep and wake, to plant and harvest crops, and to reproduce. Ritual is naturally part of human existence and is a central feature of Scientist Order meditation, from the Daily Offices to rituals to marks the changing seasons and landmarks of life. Ritual marks key events in life: birth, puberty, marriage and death, reminding us of the meaning of life and our place in the cosmos. 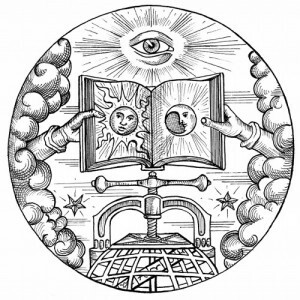 Accordingly, the whole physical cosmos is the first subject of the Novice’s Curriculum, especially that which pertains to the Observer, the “fifth element” of the ancient Royal Art, symbolic alchemy, the precursor to modern science. In alchemical symbolism, the material elements fire, water, air and earth combine to form the fifth element of Spirit (life-force and awareness, or simply, life). Physical geography, climate, architecture, interior design, furniture, implements, vestments, and other paraphernalia, in short, everything related to the “smells and bells” of ritual are all given due consideration. The Order of Science does not insist on particular meditations for the four traditional times of day: dawn, noon, evening, and midnight, or for the four divisions of the year, the four directions, the four elements, praise of the good, or denunciation of evil. The sacrifice may be a daily ritual including the ringing of a bell, the lighting of a flame and incense, the pouring of water and tea, and concentration on posture, breath and chant. The entity or life-force is invoked, using one or more invocations or exercises, as appropriate, before a flame, an altar, a mandala, the northern pole star, the sun or the moon. If an altar is used it may be empty or it may hold a single source of light, and perhaps incense, unless the monastic prefers more tangible instruments of ritual. It is traditional to enter the Laboratory from the North-East, sounds the ceremonial bell, ignites incense on a separate shrine in the East in memory of those who have preceded him, and bows. He then ignites a flame in each of the four cardinal directions, beginning with the East, bowing in each direction. Finally he kneels or stands before the Altar of Science, and lights the Sacred Fire, bowing afterward. No special garment is required, though the monk or nun may reserve special clothes for meditation, nor is any single posture or ritual essential. Order of Science monks and nuns may wear a distinctive outfit to distinguish society officers from other priests and ritualists, as every temple has its own extravagant wardrobe. The laboratory coat is fitting to the alchemist and scientist, and scientific research has shown wearing one raises cognitive abilities in students. The lab coat is clean and minimalist, elegant, yet clinical and down-to-earth. 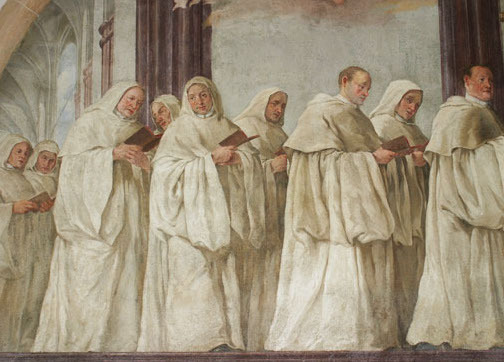 The monk or nun may experiment wearing different color lab coats during ritual, such as white, black, gray, brown, or crimson. Instructions in these matters are suggestions, not demands, and the adept need move only on the astral plane, in the subconscious mind, to accomplish vision or visualization. Besides breathing naturally, one need move not at all to accomplish meditation. The Order of Science Daily Offices method begins with posture and a conscious and progressive deep relaxation from toes to crown, with focus on breathing, which activates the blood and the body. Then, the Daily Offices meditation centers upon the recitation of scripture, chant, or song, which activates the mind and the nerves. This is a scripture taken from the “An Introduction to Monasticism,” “The Holistic Health Lifestyle,” “Meditation, the Art of Life,” “My Zen” and “Origins of Meditation in the West” essays, and an essay on the origins of science. Carl Sagan, Cosmos, Ballantine Books, New York, Toronto, 1985, p. 42.